These are all the single rooted teeth, and provide more aesthetic function rather than for chewing but the initial biting is done using the Incisors. 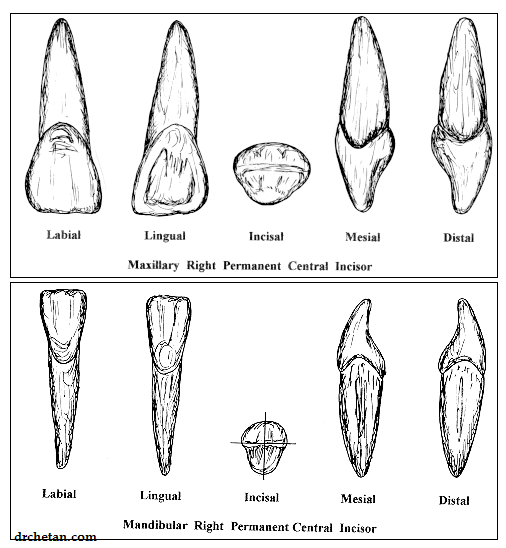 Following are the differences between the Maxillary and Mandibular incisors, i.e. the incisors of the upper and lower jaw. The permanent mandibular incisors are the first permanent teeth to erupt after the loss of the milk teeth, and these are followed by the eruption of the maxillary incisors. The central incisor is wider and larger than the lateral incisor The lateral incisor is larger and wider than the central incisor. The Marginal Ridges and Cinguli are more prominent. The Marginal Ridges and Cinguli are less prominent. Roots are rounder or triangular in cross section. No depressions are seen on mesial and distal surfaces. Roots are oval; wider labio-lingually in cross section. Depressions on mesial and distal surfaces of roots are seen. Check out the Anatomy of the tooth to understand what differences we are actually talking about, like the parts of them etc. What is Permanent dentition or Permanent teeth?